Last Thursday I had a craving for lamb and found myself drawn to Itaewon's Samarkand. It's the sister restaurant of Dongdaemun's very own Uzbek palace of delights and it has pretty much the same menu. If you're looking for inexpensive sheepy goodness then this authentic place is a good bet. 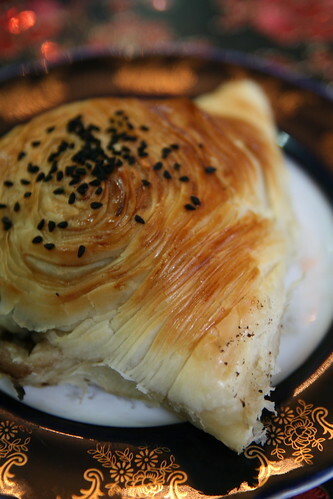 For only 3,000 won you can sample a "Samsa" a delicious lamb pastry, with other dishes such as borsch and stewed lamb ranging from around 5,000 to 8,000 won. To get to Samarkand head to Itaewon and walk up to the fire station; turn right, go up the hill and turn left just after the foreign food mart. Samarkand is a little further up on the left hand side. If you hit the mosque then you've gone too far. AWESOME! Saw this linked from ZenKimchi's Twitter. I love Samarkand, and now I don't have to go all the way out to Dongdaemun to get it! I was very excited when I found they had expanded here. Hope you get your Uzbek fix!